Wilderness trails at your doorstep! Winter Special - Stay for 7 Days, Pay for 5! Escape the ordinary and reconnect with nature at the Cedar House Restaurant & Chalets. Our 7 luxury chalets and award-winning restaurant are nestled cozily on a mountainside acreage only 5 minutes from downtown Golden, BC. Retreat to a spa-like experience in your amenity-filled chalet which includes your own private hot tub, fireplace, terry cloth robes and white linen duvets. Make yourself at home in your fully equipped kitchen complete with a BBQ on the deck. Don't feel like cooking? Enjoy an evening meal together at the Cedar House Restaurant for a fine dining experience that will indulge your taste buds. The striking mountain views and walking paths through manicured gardens will help you truly relax and enjoy your stay. Our well cared for resort property invites adventure enthusiasts of all sorts with hundreds of kilometres of single-track trails starting right at your front door. 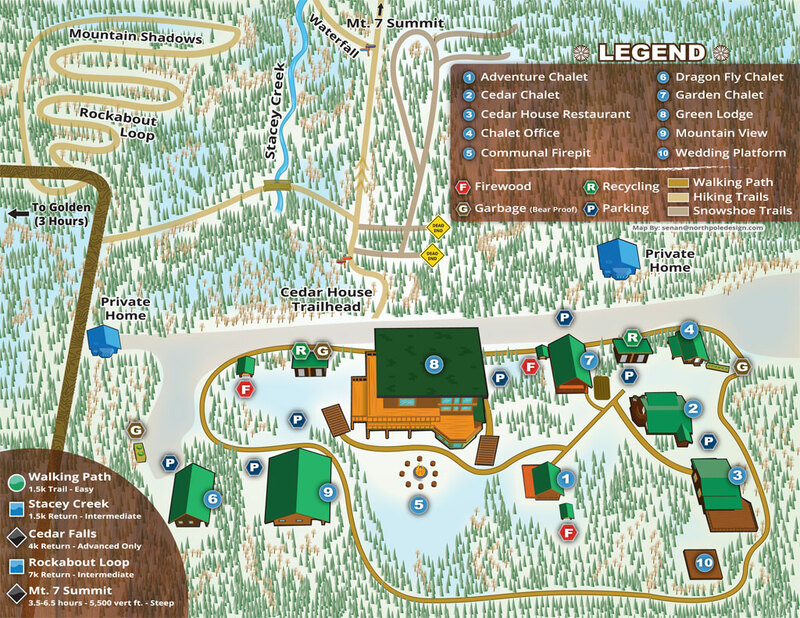 Lace up your hiking boots or use a set of our complimentary snow shoes to enjoy a year-round Rocky Mountain experience. 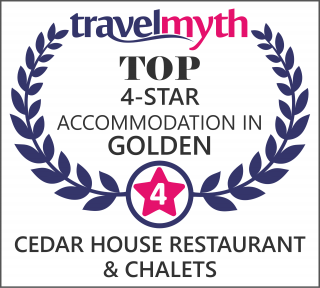 This year, make Cedar House your home base and Golden your gateway to adventure! Your mountain memories start at the Cedar House. 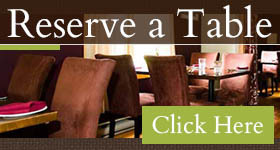 Ask about our group rates for weddings or reunions up to 40 guests and awesome weekly discounts! Please note if you are staying with us between December 16 - January 2, the full amount of your stay will be charged 4 weeks prior to your reservation.